WATKINS GLEN, N.Y. – If Chris Buescher’s breakthrough NASCAR Sprint Cup Series victory last Monday was, indeed, the biggest thing to hit his hometown since the 7th annual Prosper Fishing Derby in February…somebody needs to send him a text or a newspaper clipping for posterity. 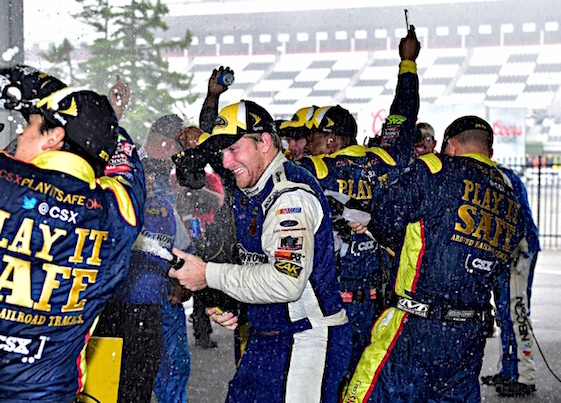 Buescher’s ensuing week has been a blur since scoring his first Cup win at Pocono Raceway, where savvy pit strategy by veteran crew chief Bob Osborne and a rolling fog bank worthy of downtown London combined to prompt NASCAR to declare the native Texan the winner after an agonizing 80-minute delay. “Hear that noise? 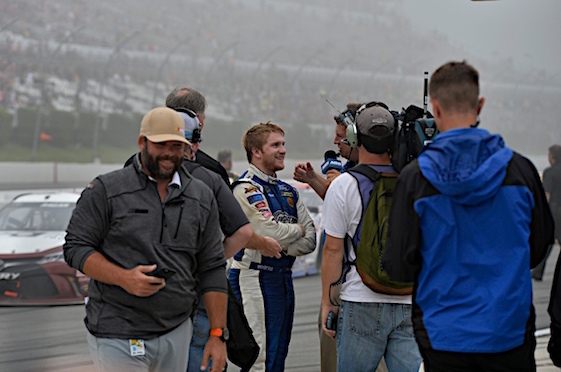 That’s all 17,000 people in Prosper, Texas, celebrating Chris Buescher’s first NASCAR Sprint Cup win at Pocono,” Texas Motor Speedway President Eddie Gossage declared via email late Monday afternoon, saluting the Metroplex’s latest favorite son. “There are a lot of NASCAR fans there and I bet some new ones were made today.” Prosper is an upscale bedroom community located approximately 55 miles north of Fort Worth. Buescher overcame a cut tire and a speeding penalty that put his No. 34 Dockside Logistics Ford Fusion a lap down earlier in the race. The 23-year-old rookie had worked his way back onto the lead lap when fog and rainy weather began to approach. As the rest of the field darted onto pit road for green-flag stops, Osborne kept his driver on-track, low on fuel but in the lead, knowing the race might be halted. As the weather worsened, NASCAR officials waved the caution flag and then the red flag, bringing the field down pit road with 22 scheduled laps remaining. When the race finally was ruled official, Bob Jenkins’ underdog team celebrated its second Cup win and first since David Ragan took the No. 34 to Victory Lane at Talladega Superspeedway on May 5, 2013. The victory was the 19th Cup career win for Osborne, many of those scored with Carl Edwards during their tenures at Roush Fenway Racing. gotten to go see any of my friends that would usually be talking about it or pumped up about it. It’s been from one outing to the next and all about trying to make sure we’re better for The Glen this weekend. “We’ve stayed traveling. We left Pocono and didn’t celebrate the slightest bit and got back to the bus and it was TP’d and we cleaned the toilet paper off after it got rained-on. Then we went to Utah for the next day and a-half and then came back. All the Roush Fenway Racing drivers and (teammate) Landon Cassill and myself were out in Utah practicing and doing some (road-course) shifting in some Mustangs. The 2015 NASCAR Xfinity Series champion, Buescher is the first Cup rookie to win a race this season in a class dominated by Chase Elliott of Hendrick Motorsports and Ryan Blaney of Wood Brothers Racing. Buescher sits 31st in the championship standings, six points outside the top-30. Buescher needs to be within the top-30 for his win to secure a berth in the 10-race Chase for the Sprint Cup championship. Five “regular season” races remain to move-up and lock-in an improbable spot in NASCAR’s playoffs. “I absolutely think we can get into the top-30,” said Buescher, who qualified 25th for today’s 90-lap/220.5-miler around WGI’s 2.45-mile/11-turn natural terrain layout. “We really shouldn’t have been out of it. It’s just been some circumstances that have gotten us a little off-track. “From my standpoint, I was trying to add it up and in my stock car racing career at 16 when I started racing ARCA, I’ve had three cars that we’ve had to throw away or at least front-clip. That’s a rather small number and we’ve gone through four this year alone. In that circumstance we’ve just had really bad luck on superspeedways this season. “Trevor (Bayne), when we were on our way to Utah to do the road-racing class earlier this week said, ‘Man, it looks like you just need a whole lot of bad luck to get one day of good luck.’ It kind of turned out that way. As we go forward, we’ve had pretty awesome support from Roush Fenway this year. A lot of the races we’ve been kind of half-and-half on what we’re doing but as we look at the Chase coming up here I think we’ll be able to try to step-up our program as much as possible. Buescher largely has been overshadowed by fellow-rookies Elliott and Blaney. Elliott is the son of 1988 Cup champion Bill Elliott, NASCAR’s most popular driver not named Dale Earnhardt Jr. Blaney is the son of former Cup regular and World of Outlaws Sprint Car champion Dave Blaney. Plenty of good racing genes have been passed down in both families. “Going to the Rookie of the Year run, the spotlight has been on the No. 21 (of Blaney) and the No. 24 (of Elliott). Does it make a difference to us? Probably not,” said Buescher, the 80th different driver to win a Cup race with Ford, and first since Aric Almirola won at Daytona International Speedway in July 2014. “We’re going to keep doing what we know to do and we’re going to keep trying to make sure that we’re up there running with those guys every week, regardless of what attention is put where. “It’s been a tough rookie season regardless, and it’s always that way whenever you move up to the next series. There’s a steep learning curve and I expected that this season. It’s the same one I went through when we got done with an ARCA championship and you move into the Xfinity side thinking, ‘There’s no problem. You’ll be winning races before you know it,’ and that’s just not the case. Front Row Motorsports was founded in 2004 and is owned by Tennessean Jenkins. FRM fields fulltime entries for Buescher as well as the No. 38 MDS Transport Ford driven by Cassill from its headquarters in Statesville, N.C., just outside of Charlotte. The team’s partnership base includes Ford Motor Company, Love’s Travel Stops and CSX Transportation. Front Row’s workmanlike approach on a lesser sponsorship budget has not gone unnoticed or unappreciated by Buescher’s garage area peers, many of whom extended congratulations Monday even before he officially was crowned a first-time winner. “That was really cool,” Buescher said. “Considering how competitive the sport is and how cut-throat it is most of the time, to be able to see everybody come by and congratulate us _ a lot of them were a little early and I kept saying I wasn’t getting my hopes up just sitting out there in the fog. There was no rain and the track was still dry and they all kept saying, ‘We are done.’ I did realize once they called it half the guys were changed in street clothes. Landon was one of the first guys to me and he was showered and in normal clothes already. They must have known something I didn’t. Buescher was informed that one Las Vegas sports books had posted his odds of winning at Pocono at a mere 1,000-to-1.